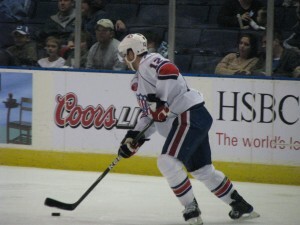 Can't Score Goals, Shutout By Griffins; Meyer Scratched · Let's Go Amerks! “Story of our season, can’t buy a goal,” were words used by coach Benoit Groulx after the Amerks were shutout 6-0 by the Grand Rapids Griffins. The Amerks also aren’t able to compete with the top teams in the AHL, as evident by the standings as well the games last night against the Griffins and last week against the Peoria Rivermen. Those two teams will be competing for winner of the conference by the end of the season. The Griffins are 17-7-3-3, the Amerks are 8-21-0-2. The Griffins have a scored 104 goals in 30 games. The Amerks have scored 59 goals in 31 games. The stats could continue, but that says it all right there. It seemed as if the Griffins did their homework on the Amerks, the first three goals were scored by simply heading to the front of the net and beating our defense to easily put the puck past Mike Brodeur. Evan McGrath scored the Griffins fourth goal as he crossed the blue line right past Michal Repik, took the pass from Francis Pare and shot it right past Brodeur. Repik should have been able to outskate that guy and prevent him from getting the pass. Mike Brodeur was pulled after the first two periods of play and replaced by Chris Beckford-Tseu. Brodeur gets a “pass” on this game. He’s been playing outstanding, but when your defense starts relying too much on you instead of stopping the puck and opposing players, and the offense can’t score, there’s only so much a goalie can do. The team was not able to get any plays going, as soon as they’d enter the Griffins zone with the puck they would take it and head back the other way. The defense is soft against top teams. The offense can’t get anything started. Let’s hope Santa is good and leaves something good under the tree for all. Stefan Meyer had “no comment” after the game. Trouble in Amerk-Ville? Meyer is tied for the team lead in goals with seven and is one of only six players with double digits in points. Seems as though Groulx is trying to send a message by scratching Meyer from the lineup showing no one is untouchable.. Drew Larman and Randall Gelech have also recently been healthy scratches. Interesting times in Amerk-Ville for sure. The Amerks return to the ice on Friday when they play the Hamilton Bulldogs at Blue Cross Arena.